Oops! Something went wrong while submitting the form. Please try again or email us at info@aahpmoco.com. This Women's History Month, AAHP is proud to honor Dr. Marilyn Hughes-Gaston, a member of AAHP’s Executive Committee. In 1986, Dr. Hughes-Gaston made history by publishing a groundbreaking study on sickle-cell disease that led to a nationwide screening program for newborns that resulted in significant reduction of morbidity and mortality in young children with sickle-cell disease around the world. Dr. Gaston has dedicated her career to advancing the health of poor and minority families. 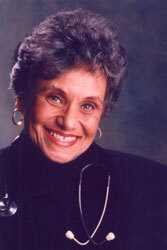 After receiving her MD from the University of Cincinnati and researching sickle-cell disease at Philadelphia General Hospital, she eventually went on to serve as director of the Bureau of Primary Health Care in Health Resources and Services Administration for the Department of Health and Human Services. A renown ambassador of health, Dr. Gaston is highly sought after as a speaker on such topics as women's health, minority health, eliminating health disparities, improving access to health care, sickle-cell disease, and the needs of children and adolescents. The African American Health Program is funded and administered by the Montgomery County Department of Health and Human Services and implemented by McFarland & Associates, Inc.
Website design by SUPER Digital, LLC.